In Altoona, you'll find a place to let your dog off the leash so he can run without you dragging behind! Sit on the bend and let him run himself ragged while you enjoy a nice spring day. 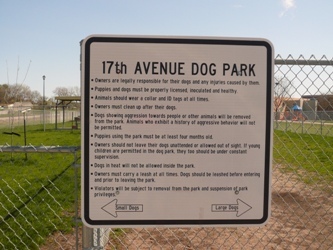 Altoonas Seventeenth Street Dog Park is located on the south side of town. Clean, convenient and quiet (other than the barking!). A large fenced in area for dogs to run, play and romp. And dont worry about Rover getting run over by bigger dogs. There is a place for small dogs separate from the larger breeds. Rover works out some of his energy while you relax on the bench. Just remember to clean up after your dog and give him a treat before you leave!